The New York Times has updated their NYTimes for iPad app today, to Version 2.5.4. I have never looked at how much or how little iPad newspapers and magazines support these accessibility features before today. This morning when I saw this update I did just a quick bit of testing with the iPad editions of The Wall Street Journal and the newly updated NYTimes for iPad – and the difference is certainly notable, with the NYTimes app making if far easier for Voiceover to read an individual article. It may just be that I’ve missed it, but I also don’t recall seeing reports of this sort of update for any other leading iPad newspaper or magazine titles. If any of you are visually impaired iPad users or just knowledgeable on this subject, I hope you’ll leave a comment and fill in some of the gaps in my knowledge. Here’s an App Store link for NYTimes for iPad. I am leaving a comment here in the hopes that you or someone else who comes to this forum can provide me some insight. I am totally blind and use VoiceOver all the time on my Mac and iOS devices. 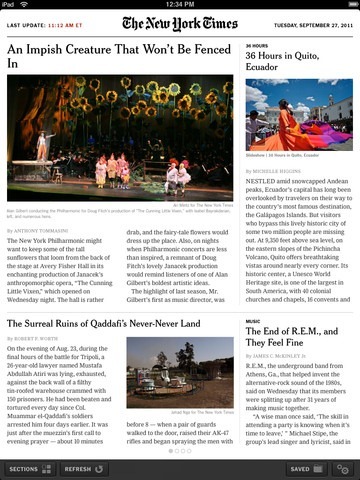 Recently I started using the NY Times app for iPad. True, it does work very well with VoiceOver. However, the problem I’m having is getting back from an article to the main screen of the app where I can pick another article, choose a different section, access settings, etc. On the iPhone version of the app this is not a problem, because there is a button in the upper lefthand corner of the screen which lets you go back. This button does not appear to be present on the iPad version. So, what is the supported way to go back once you’ve finished reading an article? And, is that same method supported by VO in the current version of the app? I called the NY Times, but they were not too familiar with my situation. I may try to email them if I don’t get an answer. Thanks so much. Hi Matthew – I’m sorry – I don’t know the answer on this one. I did a bit of searching and did not find anything useful to share. My best suggestion right now would be to post the question in the Apple Discussion Forums and email the NYT as you’re already planning to.